When the weather is so hot, all I can think of eating are cold foods. 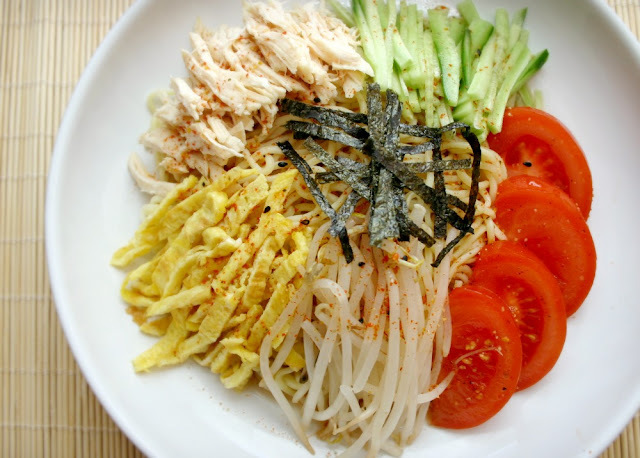 Japanese cold noodles are a great alternative to the usual salads and cold sandwiches. 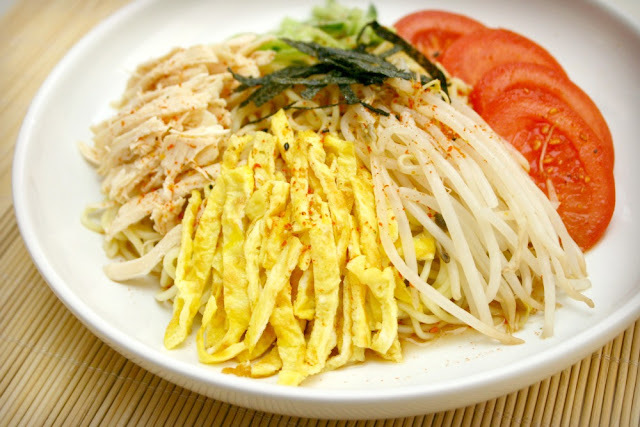 We commonly eat two kinds of cold Japanese noodles in my household -- simple Soba noodles with a dipping sauce and Hiyashi Chuka. My kids prefer the Soba noodles because I serve them very simply; topped with some green onions, seaweed and some sesame seeds. 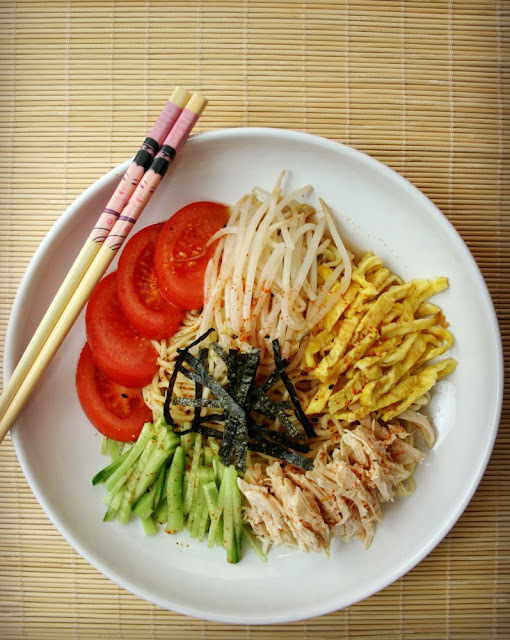 I much prefer Hiyashi Chuka because of all the refreshing, crunchy vegetable toppings that sit atop a pile of egg noodles. 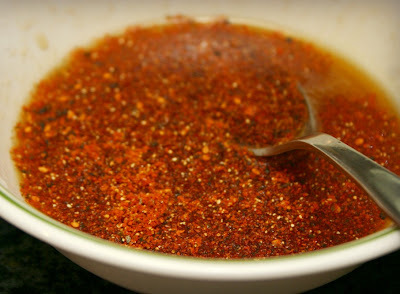 I also love the light dressing for this dish which is vinegar based and flavored with a touch of sesame oil. I like to use fresh egg noodles but you can pretty much use any noodle you like. This dish is also commonly eaten with red pickled ginger and a Japanese mustard (called karashi mustard) but since we're not big fans of either of those condiments, I left them out. Hey, if you're eating this dish, feel free to top it with whatever you like. Other toppings you can try: Spam, ham, kamaboko, Chasu, imitation crab sticks, thinly sliced beef, shrimp, red or green pepper, shitake mushrooms, carrots, celery. Bring a pot of water to boil then place the fresh noodles in. Let simmer for a couple of minutes until the noodles have softened and have loosened up. Drain the noodles well then place in the refrigerator to chill. Combine the dressing ingredients in a bowl and whisk it all together. 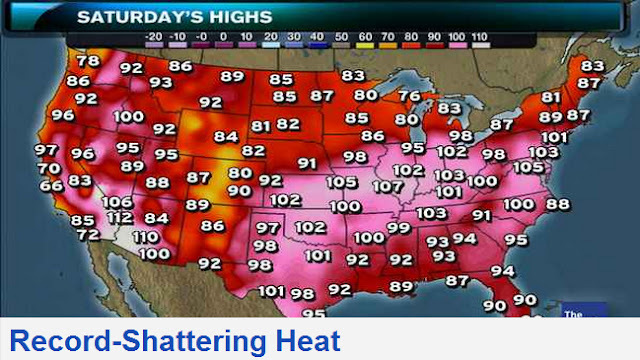 Feel free to adjust the level of sweetness or heat to your preference. Chill the dressing in the refrigerator. Add a pinch of salt and sugar to the egg and beat well. 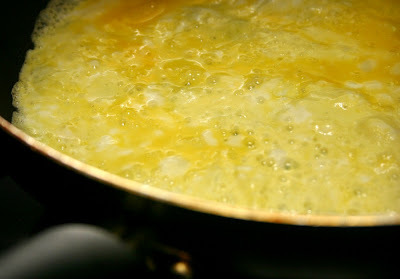 Heat a small amount of oil in a medium frying pan then add the beaten egg to it. Spread the egg out as much as possible into a thin layer. When cooked through, remove from heat and allow to cool. Slice the egg into thin strips. 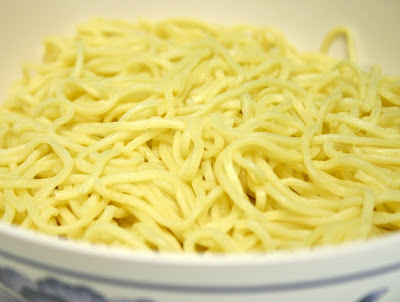 To serve, divide the noodles onto two plates. Arrange the vegetables, chicken and egg neatly on top. Drizzle the cold dressing over the noodles and top with seaweed strips. A great summer dish to serve for lunch and dinner on hot days!